The Mount Irish site is rich with Rock Art, with three distinct areas to explore. 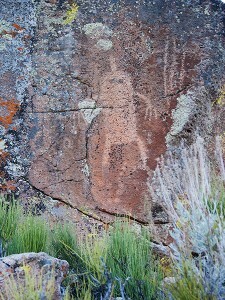 The numerous petroglyphs, along with scatters of chipped and ground-stone, pottery and rock shelters, suggest the sites were occupied from 1000 B.C. to the 1860s.Most of the petroglyphs are of the Great Basin Representational stylem (A.D. 1-1500) often depicting bighorn sheep and deer. The earliest occupation in southern Nevada began about 11,000 B.C. at Tule Springs in the northwest portion of the Las Vegas Valley. The ancestries of the earliest Native Americans have not been traced to the present, but the contemporary Paiutes and Shoshones are considered the descendants of the last huntergatherers in southern Nevada. The archaeological record in southern Nevada reflects the activities and life ways of people who, during the past several thousand years, were experts in living in an arid environment. They learned to utilize natural resources and were “hunters and gatherers” of their food. They lived in open camps, brush structures and caves. They moved in family groups throughout a selected territory collecting seeds and capturing animals on a seasonal basis. 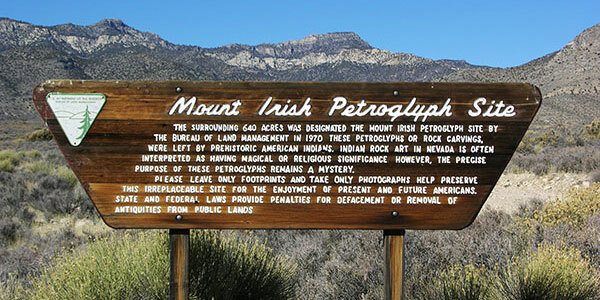 The entrance and gate to Mount Irish Rock Art Site is 3.9 miles from the intersection of State Route 375, State Route 318 and U.S. Route 93 (the “Y”). Traveling north on State Route 318, towards Ely, it is on the left (west) side of the road just past Key Pittman Management Area. 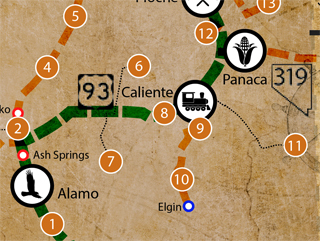 A yellow BLM marker is just to the left of the gate. Go through the gate, and continue approximately 9.0 miles to the register.